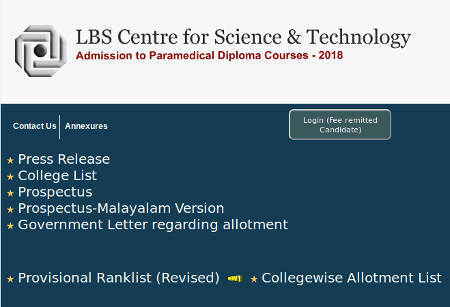 LBSCentre for Science and Technology invites online application for admission to DPharm, Health Inspector and Paramedical diploma courses under the Govt / Self financing colleges in Kerala for the academic year 2019-20. Eligible candidates can apply online through LBS website from July, 2019. LBS Centre Dpharm/ Health Inspector/ Paramedical Diploma courses Admission Notification and Prospectus are avaialable from www.lbscentre.in. Kerala Dpharm/Health Inspector/Paramedical diploma Admission LBS Application. Applicants shall have completed 17 years of age on 31.12.2019 and upper age limit is 35 as on 31.12.2019. D Pharm (DP) Courses Eligibility: Candidates who have passed the Higher Secondary Examination of the Kerala state with Physics,Chemistry and Biology/Mathematics as Optional subjects or equivalent there to are eligible. OR VHSE of Kerala from 1994-1995 sessions with group A and B only are considered as equivalent exam for admission to DPharm Course (Group A – NCERT syllabus in Physics, Chemistry and Mathematics; Group B – NCERT syllabus in Physics, Chemistry and Biology. Health Inspector Diploma Courses (HI) Eligibility: Candidates who have passed Higher Secondary examination of the Board of Higher Secondary Education, Kerala, or examinations recognized equivalent there to,with 40% marks in Physics, Chemistry and Biology put together, are eligible. Relaxation of 5% marks will be allowed to SC/ST candidates. Paramedical Courses Admission Eligibility : Candidates who have passed Higher Secondary examination of the Board ofHigher Secondary Education, Kerala, or examinations recognized equivalent thereto,with 40% marks in Physics, Chemistry and Biology put together, are eligible. Relaxation of 5% marks will be allowed to SC/ST candidates. Candidates who have passed VHSE with 40% marks put together for Physics,Chemistry and Biology are eligible. Relaxation of 5% marks will be allowed to SC/STcandidates. Application fee can be remitted by all applicants except service candidates at any one of the notified branches of a Scheduled Bank in Kerala, using the chalan generated on-line during the process of submission of application form. There will be three stages for the submission of Application form and all stages are mandatory. Candidates shall complete all the stages of submission as per the time schedule which will be notified through the website/media. Stage 1 : Entering candidate details online followed by remittance of application fee at the branch of the scheduled bank (which will be notified later) after taking printout of the challan from the website www.lbscentre.in. Stage 2 : Confirmation of Registration of Personal Data and forwarding of the printout of the application form with supporting documents. Stage 3 : After publishing the provisional rank list the candidate has to register college/course options during the prescribed time. After declaration of results of the qualifying examination.